In the early 1990’s, I taught a course entitled, Introduction to Film at McGill University, that had six hundred registered students in it. This was well before MOOCS and Coursera and other massive online courses. It was also before the Internet transformed learning and education and the way we understand the flow of information in digital cultures. I would like you to imagine six hundred students as a small community of people with a variety of differing interests, proclivities and identities. The students divided themselves into groups of varying sizes. There were the “guys” from the football team, who sat far away from the podium so that they could talk to each other. There were students from at least twenty different countries and they clustered into different groups. Generally, these clusters sat in the same place, from week to week during the yearlong course. There were Trotskyists in one corner and Maoists in another. There were gays, studious types, loudmouths and the ones who insisted on eating during my lectures. The course was evenly divided between men and women, which is now a rarity. I showed films, lectured, held seminars with the assistance of a group of terrific teaching assistants and generally spent many hours meeting students in my office. In fact, the Dean of Arts at the time had his office not too far away from mine and remarked that I seemed to have a lineup outside my office on a continual basis, everyday. The purpose of this piece, however is not to reminisce about my extraordinary experiences in the teaching of that class. Rather, my own thoughts about the course have over the years profoundly affected my feelings about the nature and flow of information and how we learn new ideas. Let me take one specific example of the issues I am exploring. 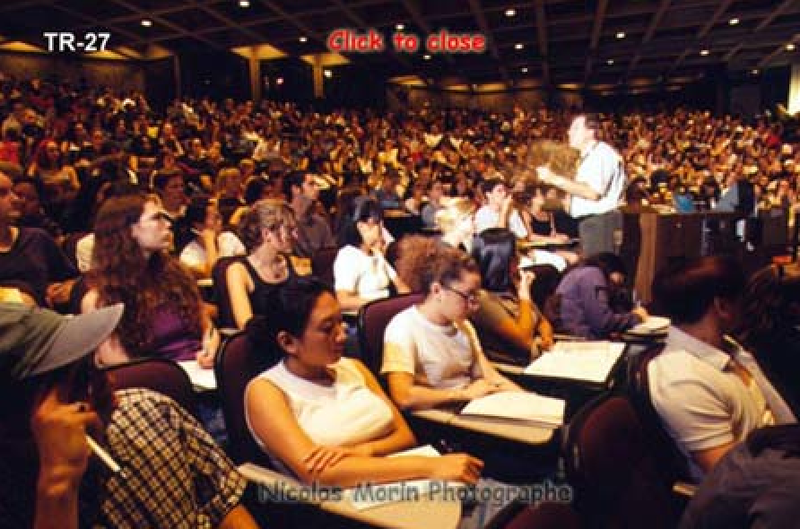 When I stood in front of the class, I could only see a few of the faces among the sea of bodies in Leacock 132. I was simultaneously an observer, an actor, a participant and a teacher. Someone observing me would have seen how challenging it was to struggle with all of these roles and still stay connected to the students. By connected, I mean aware of the dynamics of interaction between them and me, sensitive to the difficulties they were having focusing on my words and manner of speaking, and conscious of the likelihood that a significant minority were essentially in a daydream. The latter group would hear my words through the haze of individual thoughts, and personal reflections that define what it means to be a listener. In addition, the entire environment was social, defined as much by the content of the class, as by the interactions people were having with each other, both in the class and outside of it. This combination of experiences has an aggregated impact enlarging the ‘field’ of communications. It is challenging to map this multi-layered set of conditions. It is however clear that the simple notion of communicating information and ideas to a group of that size, through the format of one to many and with the force of words, is naïve if not misinformed. I loved the class and I believe we had a great year together, but there was nothing linear or even clear about the experiences. At best, the link between the students and me was fragile. At its worst, there was a great deal of misunderstanding. This is inevitable in any situation of interaction between individuals in large groups. I was in a unique position as an observer, who was constantly being observed, and as a result I had to think about information and how to enlarge the potential points of contact between my students and me. We generally think that the same event or set of ideas shared between two participants or observers will be described in similar ways. But, we never know exactly when the process of interchange has begun, how it is maintained and whether both parties are able to concentrate on the same things. Clarity of speech may not lead to clarity of understanding. In fact, all we can do is approximate our general assessment of what has been exchanged. The process of information exchange is filled with static noise and is consequently very indirect. Ironically, new ideas grow from this conflict. The clash between expectations, failure and success leads to more and often richer efforts to find common ground. And, there is no way of developing a simple formula that will magically overcome these challenges.